In the past, many DPL candidates have stated that they wanted to make Debian more fun, this is becoming a cliché by now, like aspiring Miss Universe girls wanting "World Peace". The fact is, we all want world peace and we all want to make Debian more fun. And although both seem as hard to accomplish, I think that we can actually make it work for Debian. The first step is to define what "more fun" means. Debian is more fun when we can work together; when we are able to do more stuff, without fighting or hurting people's feelings; when after a lot of work into a certain project we feel that it was useful and welcomed by the community. Thus, one of my goals is setting a positive atmosphere for Debian to be more welcoming towards the work done both by package maintainers and other contributors. So that everybody feels their work is appreciated and valued, and that we can keep working together on making the best possible OS. To keep being fun, Debian also needs to reach out, to be more promoted, so that we keep getting new users, otherwise we are going to grow into a deep closed club. We need to make Debian attractive, both to the current developers, contributors and users and to the possible future people involved, and get rid of the myth that Debian is "difficult". Finally, and I think the most important of all, is that in order to have fun, we need to be proud of what we do. Every contributor, from the occasional bug reporter to the member of the core development teams, should be happy to participate in such an awesome project. And for that to happen Debian has to keep current, keep getting better and better and never stall. There are probably many ways in which to achieve those goals, these are some of the ideas I have on how I plan to work towards them from the DPL role. This is not a complete list of what I'd do. Lots of developers do a lot of silent work and rarely get thanked. I'm planning for a "Debian appreciation day" in which everybody is encouraged to thank the maintainers of their favourite and most used packages, and the administrators of our infrastructure services, and when users just want to thank Debian, they get to say thanks to one random developer. We'd all benefit by giving more attention to internal developer news. The DeveloperNews page or the news.debian.net site are efforts to communicate among developers that would be more valuable if more people participated by providing pieces of noteworthy information, so that everybody could have an idea of what's going on and where their help is needed. I plan to encourage this type of communication project-wide. In order to promote Debian, we could come up with a "Debian/Rules" campaign, with web-banners or ads for users and developers to put in their websites; promote official "fun" t-shirt designs; give posters, flyers and t-shirts for the several Debian booths present at the different conferences all over the world. Also on the image side, I think it'd be a good idea to get all the artists involved with Debian to work into giving Debian a fresh new look, applying the work that has already been done for the website, and allowing us to offer a wide variety of options for the OS theming. In order to make Debian the best of the best, we need to work together with some common ideas. The release team has established a practice of setting release goals. We could also set some yearly project goals, first finding out what Debian needs to improve and then working as a team to accomplish that. The role of the DPL is to lead, to inspire, to shine a light on things that are worthwhile and fan the flames a bit. For the listed tasks and the many others that might come up along the way, I plan to be a leader, setting goals and directions. They will only have meaning, however, if the Debian Community is united by these ideas, and we all work with that in mind. I'm a 30-year-old software developer from Argentina. I work as a developer, mainly in Python, and I teach programming at a local university. I've been involved in Debian since 2003 and I became a Debian Developer in 2005. 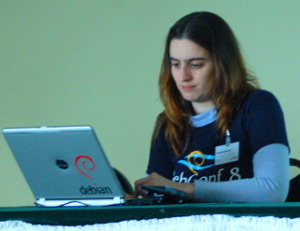 I was part of the Debian Women project since its beginnings in 2004. I've also been involved some way or another in organizing DebConf since 2005. I'm very proud to have been one of the main local organizers in DebConf8, which was a great success. In fact everything was so well planned in advance that despite being a lead organizer I was actually able to attend most of the talks! The activity I like the most when working for Debian is fixing bugs. I did a lot of NMUs for the releases of both Etch and Lenny, and I've organized several face-to-face BSPs in Argentina. This platform was prepared with the help of many people that provided input for the several ideas given. I'd particularly like to thank Moray Allan, Bdale Garbee, Ana Beatriz Guerrero López, Eric Dantan Rzewnicki, Joerg Jaspert, Raphael Hertzog and Clint Adams for their input. I don't like having to speak badly of the other candidates, so instead, I'll list the ideas and goals from their platforms that I agree with, and I would use them if I'm elected. I agree that we need to involve more people in Debian, come up with new ways to allow these people to work and be committed to Debian. I also agree that working in groups rather than individually is good for the overall quality of packages and thus we should put quality before package ownership. I agree that the role of the DPL as a discussion leader has been underused, and it's a good idea to have the DPL participate more in the important discussions, trying to lead them towards a consensus. I find the idea of a DPL "feed" interesting, but I'm not yet sure how I would implement it myself, since I don't plan to start twitting any time soon. The IRC channel option (maybe with a bot to generate web notes) seems more likely in my case. I also agree that we should work on the website, particularly working on applying the work that has already been done, and getting it to look as good as Debian actually is. I agree that we need to attract more developers in order to continue being technically excellent. I think it's a good idea to ask people from the outside what they think that Debian is missing and what their perceived problems are, and try to work on those as well as our own perceived problems. I think that contacting delegates, renewing delegations, and generally clarifying all the delegates' status is something that every DPL should do, and I definitely plan to do that if elected.